Onderlinge ‘s-Gravenhage is an insurance company which has been providing life insurance and bearing financial risks for customers since 1895. Onderlinge ’s-Gravenhage likes to keep its customers, intermediaries and directors up to date about the latest developments within the industry, irrespective of their time zone and location. The company was therefore keen to make use of webinars. 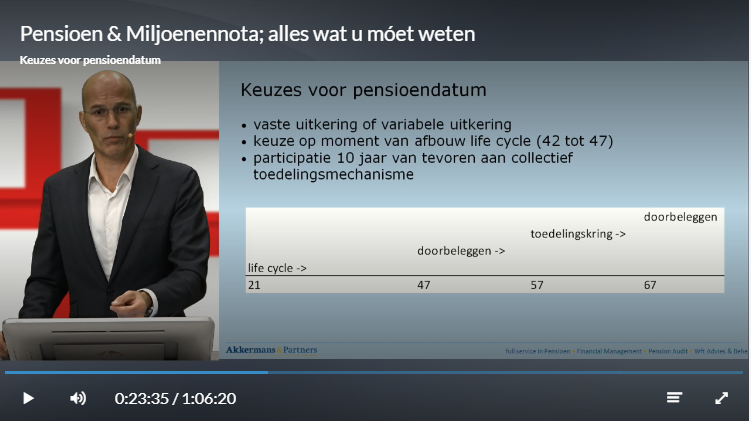 Onderlinge ’s-Gravenhage approached Company Webcast with its idea. In order to ensure an optimally professional result, the decision was made to record the broadcasts in the Company Webcast webinar studio. Company Webcast takes care of the transmission of company updates in the form of webinars which are broadcast from our own professional webinar studio. The webinar saves participants a lot of valuable time, including journey time. They are brought up to date quickly and easily via their own PC or tablet. During the live webinar there is plenty of opportunity to ask questions, all of which receive an answer – either live or afterwards.